Janelle In Real Life: these boots. Fall is for layering and pattern mixing. Lets talk for a sec about how these boots. I got them on serious clearance from target like 5 years ago. Seriously guys, I remember buying them during my first Christmas vacation visiting home as a little college freshman. I went on to wear them every.single.day during the snowy season while I trudged through the ice and snow to school every day. And they are hardly worn out! It's amazing. They are the boots that will never die and I plan on continuing to wear them forever. Have a super day, friends! Dropping by from Three-fer Thursday! I love the prints you mixed in this look! Perfect for fall. 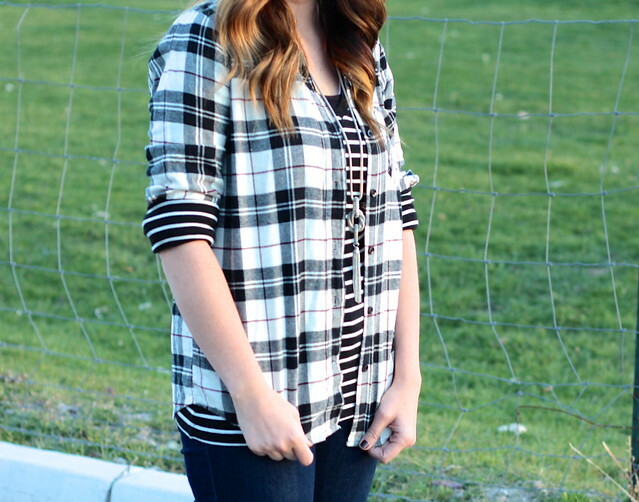 love the way you mixed plaid and stripes. ...and your hair color and style is fabulous. Woaaah five whole years?! The longest I've ever had boots is like two years haha those Chicago winters destroy them. What an awesome score!! 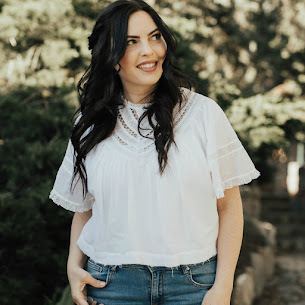 PS- I'm popping by from the Tres-Chic Fashion linkup! The plaid and stripes combo is awesome, and I love the boots! I'm a big fan of boots that refuse to die!! It's so sad when beloved shoes die! Ooh I love the pattern mixing with your b&w tops! love the boots! They look really comfortable and versatile to wear with different outfits. Love the print mixing and your cute boots! Thanks for sharing with Three-fer Thursday!